Angels in America chronicles the intersecting lives of several characters living in New York during the mid-1980s. There's Joe Pitt, a straightlaced Mormon lawyer working in as a chief clerk in the Federal Court of Appeals. Joe is married to Harper, a housewife who Kushner charmingly describes as "an agoraphobic with a mild Valium addiction." Then there's the play's main protagonist, Prior Walter, a middle-aged gay man living with his longtime boyfriend, Louis Ironson. Louis, like Joe, works in the Federal Court of Appeals, albeit as a word processor (aka secretarial pool drone). Throw in two more central characters--the malignant Roy Cohn, a real life politico who Kushner imbues here with demonic presence, and the flamboyant, lovable Belize, a former drag queen turned nurse--and our stage is set. 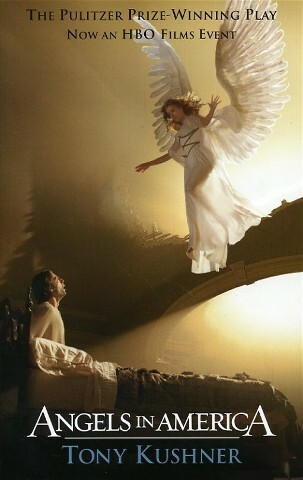 Angels in America: Millennium Approaches begins just as Prior reveals to Louis that he has been diagnosed with AIDS. As Louis grapples with the stunning revelation and its impact on his relationship, Joe is forced to confront the true reasons behind his own problematic marriage to Harper. Both relationships disintegrate and the characters, completely unknown to each other at the start of the play, become entangled in a complicated dance of heartbreak and jealousy. And if that's not enough, supernatural forces are at play here as well, with Prior plagued by visitations from a menacing Angel, and Harper imprisoned by delusions brought on by her pill-popping habit. Tony Kushner wasn't messing around when he added the subtitle, A Gay Fantasia on National Themes, to his landmark play. Angels in America is very much an exploration of the unique tensions of the Reagan-era United States in which it is set--a time marked by a rightward swing in American politics, set against the raising LGBT movement and early AIDS crisis. These issues figure heavily within Angels and, yet, they are not the only ones at play. The number of themes that Kushner explores--and explores brilliantly--within his mega-play reads like a literary laundry list: morality, Judaism, Mormonism, homosexuality, marriage, religion, Communism, betrayal, love, honor, and racism, just to name some of them. That all these themes exist within the play and never feel forced is once again a testament to Kushner's talent as a playwright. I've rarely read a piece of literature that explores so much, so profoundly, in such a truly engaging and fun way. It's the type of play you could read again and again and see something new in it each time--a true sign of a great work. Angels in America is by far my favourite play, and probably pretty close to being basically my favourite thing ever written ever. It is all these things you say and more and I love it to DEATH. Which is maybe not the best thing to say, in the circumstances. Have you seen the HBO miniseries of it? Because it's really really excellent, and I can't help imagining all the characters as the actors who play them now, but I don't mind because everyone was just PERFECT. Ok, I'm done now, promise. But, yay! So glad that you're a fellow true believer in Angels in America! Isn't it the best? I find it really hard to describe why it's so awesome ... it just is. Fantastic review! This is one of my favorites - I hope I'm able to teach it, someday. I read it for two different classes in college (one an American Drama course, the other an LGBT Lit course) and both experiences were great. Aww, thanks! What great fun it would be to teach - I hope you do get to teach it someday! I read it as part of a modern American lit class myself and had a great experience with it. It's fascinating how many different classes you could easily fit it in to - just another sign if its versatility and genius, I think. Oh no, I can't believe I wasn't following you before... But I'm doing so now!